June is National Fruit and Vegetable Month. The Dietary Guidelines for Americans set by the USDA recommends we eat more fruits and vegetables than any other food group. In fact, they say that half of your plate at every meal should be a fruit and/or vegetable. Every step that you take towards eating more fruits and veggies will help you make sure that your body is performing at optimum levels. What better opportunity than National Fruit and Vegetable Month to add more healthy fruits and vegetables into your diet? 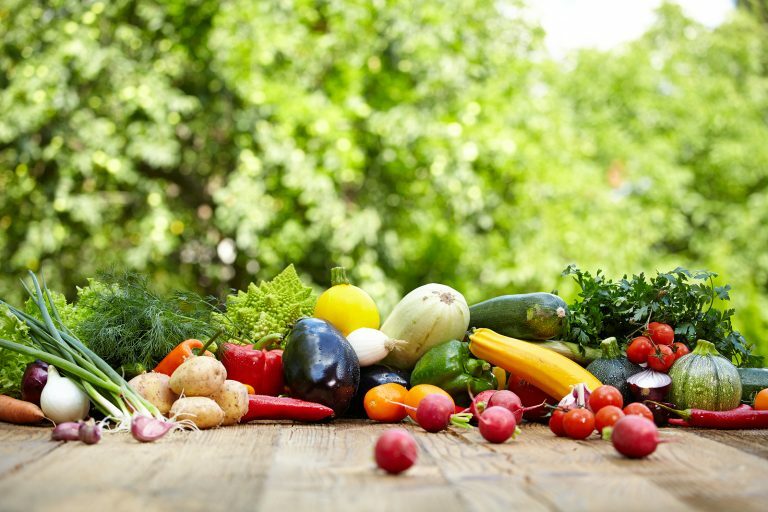 The USDA states that people who eat more fruits and vegetables as part of an overall healthy diet are likely to have a reduced risk of some chronic illnesses. Fruits offer nutrients that are vital to maintaining your health. Many fruits contain dietary fiber, folate (also known as folic acid), potassium, and vitamin C. No fruits have cholesterol and the majority of fruits are naturally low in calories, fat, and sodium. Vegetables are also full of nutrients that are important to your health. Common nutrients found in vegetables are dietary fiber, folate, potassium, vitamin A and vitamin C. Most vegetables are low in calories and fat and contain no cholesterol. Both fruits and vegetables are known for their dietary fiber. Diets that consist of foods rich in dietary fiber can reduce your risk of obesity, type 2 diabetes, and heart disease. Fruits and vegetables rich in potassium could lower blood pressure, increase bone strength and mass, and reduce the risk of getting kidney stones. Green fruits and vegetables contain luteins which can protect your eyes from cataracts. Beta-carotene is prominent in orange vegetables and help boost the immune system. Red fruits and vegetables have larger quantities of anthocyanins and lycopene. These help to keep your heart healthy and reduce the risk of some cancers. Purple and blue fruits and vegetables are rich with antioxidants that improve memory function and protect you from cell damage. White fruits and vegetables are shown to lower blood pressure and cholesterol levels. The biggest thing to remember when storing fruit and vegetables is to practice the rule FIFO. FIFO means “first in, first out” and is used by grocery stores everywhere- so why not practice it at home? This rule mostly applies to canned and frozen goods as fresh fruits and veggies are typically utilized right away. When you store your fruits and veggies in the pantry or freezer rotate newly bought food to the back and the older ones to the front so that they are used first. This will help prevent the food from going bad and reduce waste. When it comes to your fresh fruits and vegetables it is important to wash them properly before you eat them. Washing well helps to remove any traces of pesticides or dirt and the wax coating that may have been added to them to keep them looking nice in the store. Use clean, cool running tap water to wash your produce. For porous fruits and veggies you may want to use a “nail brush” to scrub them and get all of the dirt out of the nooks and crannies. You don’t need to use specialized produce scrub, clean water works fine. You should never use soap as there is a possibility that you won’t be able to remove all of it- and eating soap could possibly make people ill.
Fruit and veggies consumed in almost all forms count towards your daily total. They can be frozen, canned, dried, fresh, or 100% juice. According to Fruits & Veggies: More Matters, canned and frozen foods are processed within hours of their harvest so that their nutritional value and flavor are preserved. Including more fruits and vegetables can be fun. They are available in almost and infinite variety so there is always something new to try. They are also a natural, quick and convenient snack! Check out these surefire ways to make sure you are adding more fruits and vegetables to your diet every day. Keep in mind that fruits and veggies in all forms matter. So grab some fruit and vegetables throughout the grocery store. Buy some canned and frozen. Buy a bag of dried bananas or cranberries, or whatever your favorite fruit is and make it into a trail mix (or enjoy as is). And, of course, grab a jug of your favorite 100% fruit or veggie juice. Add a can of vegetables to your canned soup or add some mushrooms, peppers, and/or onion to a jar of spaghetti sauce for a quick meal with extra nutrition. To go even further with the spaghetti, use spaghetti squash instead of noodles. When you make lasagna add pureed veggies to the sauce. Another option would be to add vegetables like sliced peppers, shredded carrots or chopped spinach between the layers. When you are out to eat most restaurants offer sandwich/soup/salad options. Order extra veggies on your sandwich (avocados or cucumbers are great choices) or try a vegetable soup. Another option would be to choose a fruit or veggie salad, but remember to order dressing on the side to control the amount of calories you will be eating. Order entrées with a lot of vegetables like fajitas or stir fry. For a quick and healthy snack that is great on the go, spread some peanut butter on a tortilla and add your favorite fruits, fresh or dried, roll it up and enjoy. Add fresh fruit to your yogurt. Bananas, apples, and plums are the natural fast food. A healthy, mess-free choice for a snack or meal on the go. Look up your favorite fruits and vegetables under the Fill Your Plate recipes section for some more inspiration. Fill Your Plate offers a lot of information about various fruits and vegetables here on our blog. For more detailed information about certain produce items such as watermelons or carrots, for example, you can look them up in our older posts. One thing is certain, fruits and vegetables are an extremely valuable part of our diets, and you can only benefit from adding more to your everyday diet. This entry was posted in Diet Tips, Food Facts, Fruit, Health Tips, Healthy Eating, Vegetables and tagged Arizona produce in season, Fill Your Plate, food, Fruit, Healthy Eating, Home, local food, Vegetable. Bookmark the permalink.